How do evolutionary mechanisms promote the development of cancer, in particular the resurgence of tumor growth following initially successful therapy? A new Collaborative Research Center, coordinated by LMU, will look at this vital issue. Research on oncogenic diseases has made great strides over the past few decades. In spite of the advances made in our understanding of tumorigenesis, cancer is still among the leading causes of death worldwide. In particular, relapses due to the outgrowth of drug-resistant tumor cells following chemotherapy confront clinical oncologists with a huge challenge. Although the spectrum of genetic alterations present in tumors at the time of diagnosis has been extensively investigated, comparatively little is known about the evolutionary principles that contribute to the growth of the primary tumor, and often lead to the recurrence of the disease following treatment. A new Collaborative Research Center (CRC) on the “Genetic and Epigenetic Evolution of Hematopoietic Neoplasms” hopes to change this by using a new approach to probe the mechanisms that drive tumor development. “We plan to study the dynamics of oncogenic disease from the standpoint of evolutionary biology,” says Professor Heinrich Leonhardt of LMU’s Biocenter, the designated Coordinator of the new CRC. In their efforts to understand the impact of phenomena such as mutation, selection and cellular interactions on tumorigenesis, Leonhardt and his colleagues will focus on leukemias and lymphomas – cancers that involve the precursors of various types of white blood cells. “Patients who present with these disorders frequently respond well to therapy at first,” says Leonhardt. “But within a year or two they may relapse, and the secondary tumor cells are often much more aggressive and more difficult to control, so the prognosis is correspondingly poor. 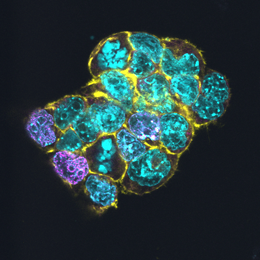 The tumor cells that survived the initial therapy have obviously changed and become more resistant in the meantime.” The participating scientists intend to tease out the mechanisms responsible for these alterations by using an interdisciplinary approach, in which molecular biologists, population geneticists and evolutionary biologist will cooperate closely with clinical researchers and bioinformaticians. “Our goal is to understand the basic developmental dynamics of tumors, with a view to improving diagnostic procedures and contributing to the discovery of new therapeutic strategies,” Leonhardt says. The new CRC formally begins on January 1st, 2016, and is funded by the German Research Society (DFG). Its total budget amounts to some 9 million euros, to be disbursed over four years. LMU as the coordinating institution will be partnered by the Technical University of Munich (TUM) and the Helmholtz Center Munich.